March is Women’s History Month, and throughout American history, women have been on the front lines of labor reform movements fighting for better wages, safer working conditions, and equal rights. In fact, it was a petition for a 10-hour workday from the Lowell Female Labor Reform Association in 1844 that provoked the first ever U.S. government-led investigation into working conditions. Over 50 years later in 1910, the International Ladies’ Garment Workers’ Union held a massive strike of 60,000 cloakmakers that gained national attention and became known as “The Great Revolution.” In 1919, Julia O’Conner and 9,00 other women at the Boston Telephone Operator’s Union organized a strike for higher wages that resulted in a major win for their cause and for laborers across the country. Among all of these women playing crucial roles in important labor reform movements, perhaps no example shines brighter than the Radium Girls of the 1920s. Their courage and perseverance changed the course of occupational disease labor law, which mandates that workers ought to be compensated if they contract illnesses because of their working conditions. When Marie and Pierre Curie discovered radium in 1898, they believed the glowing substance to be an all-powerful wonder element. After it proved to be an effective cancer treatment, the scientific community jumped at the chance to see what radium could do — but they weren’t the only ones fascinated by the shining element. Its supposed magical healing properties and fascinating appearance made radium a craze in the United States, and it was synthetically manufactured starting in 1910. Radium was advertised as “A Cure for the Living Dead,” as “Perpetual Sunshine.” It became an additive in everything from chocolate and drinking water to toys and cosmetics — but one of its most popular uses was for self-luminous watches. Two companies took particular advantage of radium popularity: the United States Radium Corporation and the Radiant Dial company. 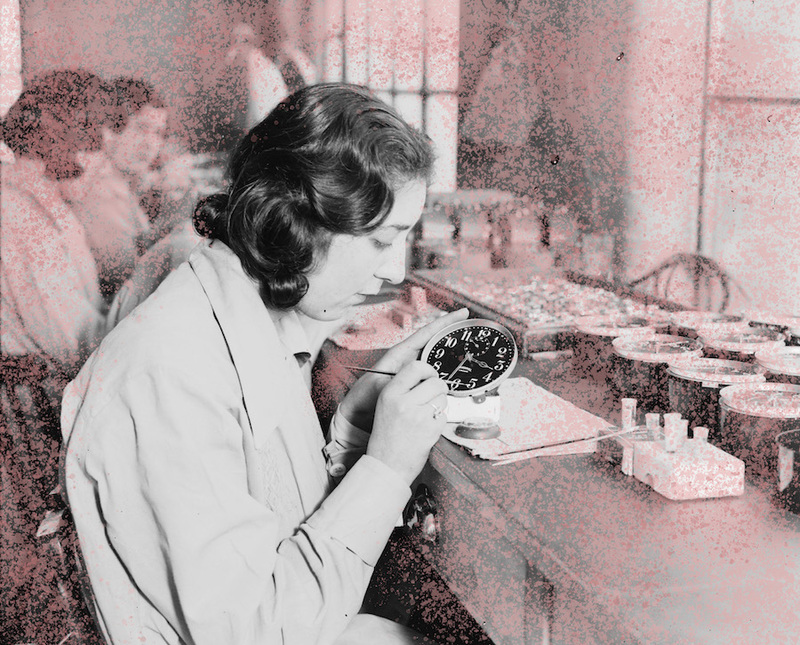 Together, these companies employed hundreds of women in factories in New Jersey, Illinois, and Connecticut, where they painted watch faces with glowing paint made from radium. Being a dial-painter at one of these watch studios quickly became a sought-after job among young women. Not only did it pay well and provide girls with financial and personal freedom, but it came with an unbelievable perk: access to radium. Like everyone else in the country, the female dial-painters were fascinated by the wonder element and thrilled to be able to work with it so closely. In these bustling factories, the Radium Girls (as they would later be known) were surrounded by a dangerous material that they had no idea was slowly killing them. Not only did radium powder cling to every inch of their work spaces, but it stuck to their skin and hair, covered their clothes, and was sucked into their lungs with each breath. They were instructed to use the “Lip… Dip… Paint” technique, which involved them literally inserting radium-covered paint brushes into their mouths to save the watch companies’ money and material. This unknowingly cost hundreds of women their lives. By the early 1920s, it became clear to the girls at the watch studios that all that glitters is not gold — or in their case, all that glows is not good. Women working in the factories began suffering from achy joints, sore backs, and unexplained pain all over their bodies. In more severe cases, their teeth and jaws degenerated and decayed. In the worst cases, they died. What began for many of them as a shiny dream quickly devolved into a dark, hellish nightmare. In September of 1922, just shy of her 25th birthday, Mollie Maggia became the first dial painter to die from what would later be identified as radiation poisoning. Her passing was slow and gruesome. According to the account in Moore’s book, “Her mouth, empty of teeth, empty of jawbone, empty of words, filled with blood, instead, until it spilled over her lips and down her stricken, shaken face. It was too much. She died, her sister Quinta said, ‘a painful and terrible death.’” She would not be the last to suffer such a cruel fate. Despite Mollie’s horrible death and the mounting evidence that these workers’ ailments were tied to their job, both major self-luminous watch manufacturers ignored the signs and tried to keep the truth about radium’s deadly effects hidden. Even as more and more women got sick, their occupational illnesses were ignored and treated as “female hysteria” (as most women’s health issues are treated — both then and now). It wasn’t until the companies conducted a private investigation into their declining profits that they took any action to remove workplace hazards. By then, though, it was too late. In 1925, tired of watching numerous friends get sick after working with radium, one glowing girl took action: Grace Fryer. An employee of the original United States Radium Corporation plant, Grace decided to sue her employer — but it took two years before she found a lawyer willing to take on New Jersey’s occupational injuries law. By 1927, Grace and four fellow employees were on the front page of every newspaper, finally going to court for their right to sue employers as individual workers who contracted diseases in the workplace. A year later, the court settled in the women’s favor, sparking a chain reaction that would alter the history of U.S. labor laws. Following the victory of the five Radium Girls, hundreds of other women flocked to the courts to seek justice and retribution from employers who knowingly put them in harm’s way. The watch manufacturers appealed the courts to no avail; by then, it was impossible to ignore the truth about radium. It was a dangerous and potentially lethal element, and those who worked with it needed protection from it. In factories across the country, workplace precautions were mandated and employees were educated about their jobs’ potential risks. Thanks to the Radium Girls’ lawsuit and the front page publicity it generated, it wasn’t just the lives of dial-painters that were transformed. The lives of every American laborer improved because of their fight. Several key changes were made to labor laws, including workers’ compensation, occupational disease labor laws, and safety standards. Outside of industry, the Radium Girls inspired the scientific community to more thoroughly investigate the effects of radium in order to better protect people from them. Grace Fryer died on October 27th, 1933 at the age of 34, just five years after her landmark settlement changed the course of occupational disease labor law and radiation studies. Grace Fryer and her fellow fearless Radium Girls lost their lives, but their legacies eternally glow within the women they have since inspired to take charge of their own futures.